The Emerald Ash Borer (EAB) is on its way to Nebraska. It is an invasive beetle that lays eggs on ash trees. The larvae hatch, bore into the layer of wood beneath the bark, responsible for water and nutrient movement in the tree, and this eventually kills the tree. EAB is currently 80 miles away from Omaha and in Iowa, Kansas, Missouri, Minnesota, and Colorado. Omaha has an estimated 100,000 ash trees, all of which would be wiped out by an EAB infestation. This will remove 14% of Omaha’s tree canopy and change the landscape of our city. Almost every tree lining Emile and Farnam Streets on the 42nd and Dewey campus are ash trees, as are almost all of the trees lining Regency Parkway, Abbot Drive, and along the streets of Memorial and Elmwood parks. Not only will we lose the trees and the benefits they provide, but removal of the dead trees will cost millions of dollars. So far, EAB has killed an estimated 54 million trees in the U.S. in the last 13 years. Don’t move firewood as beetles and larvae can hide and be transported. Buy local, burn local. Plant diverse species to protect against future loss. Do not plant ash trees now, as they will be killed when EAB arrives. Last week was EAB Awareness Week. To help spread awareness, the Omaha Parks Foundation and City of Omaha Forestry Division held a press conference and wrapped trees in many city parks in emerald ribbons. 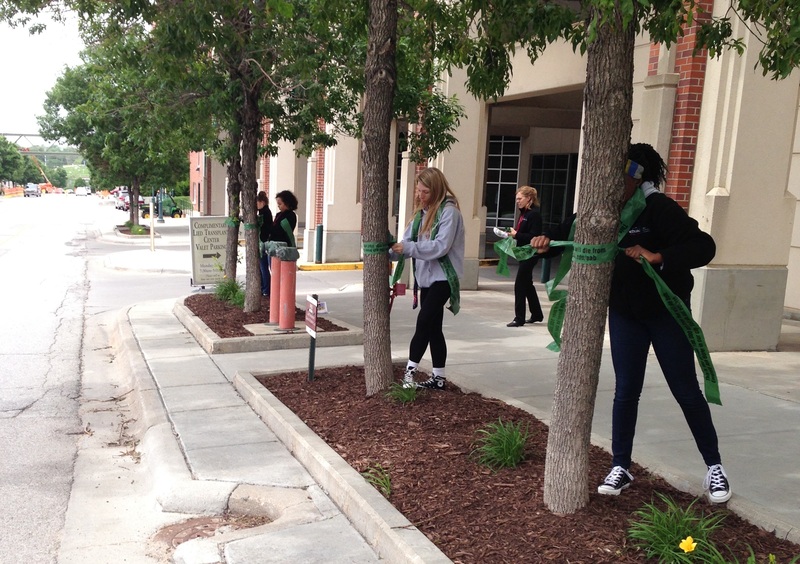 To show support, and as part of our Tree Campus USA service learning project, students with the High School Alliance wrapped many of the ash trees on campus with green ribbons. They learned about the EAB and helped to promote awareness of its damaging effects. Their efforts were covered by multiple news stations, and those stories can be seen here (contains additional info and pictures of EAB and damaged trees) and here. The High School Alliance Students continued their work and on Friday returned to campus to help pick up trash, pull weeds, and haul and spread mulch around the Durham Research Centers. The space looks fantastic, thank you for all your work! Next Next post: TravelSmart Questions Answered: Yes, It’s Really Free!